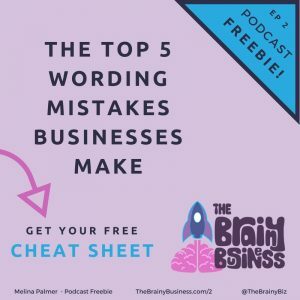 What are the Top 5 wording mistakes? This was a highly requested topic when I did a survey on The Brainy Business Facebook page. There is great discussion there, and I share different content including a lot of Live video tips and you can connect directly with me and others who love The Brainy Business! CLICK THE IMAGE TO GET YOUR FREE DOWNLOAD! Some very very useful ideas. Quite appropriate to what I’m doing right now, which is updating my website. I do battle with quite a few of the mistakes that you highlight. I will see how I use it and revert. The current website is very out of date. Thank you for the comment Jennifer, I am glad this will be useful for you in your website project. If you are in need of more specific insights, I do a lot of website work with clients and would be happy to discuss the opportunity with you!